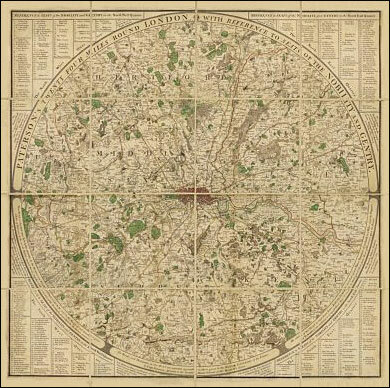 Medium size version of a cloth-backed reproduction by Old Folding Maps of Daniel Paterson's “24 Miles Round London” map published in 1791. The map presents the countryside around the capital in a circular format with colouring highlighting “seats of nobility and gentry”. Each coloured-in location is numbered and four lists placed in the corners of the map show the names of the owners. Coverage extends, roughly: past St Albans and Hertford, Chipping Ongar, Gravesend, Sevenoaks, Dorking and the edge of the Windsor Great Park. 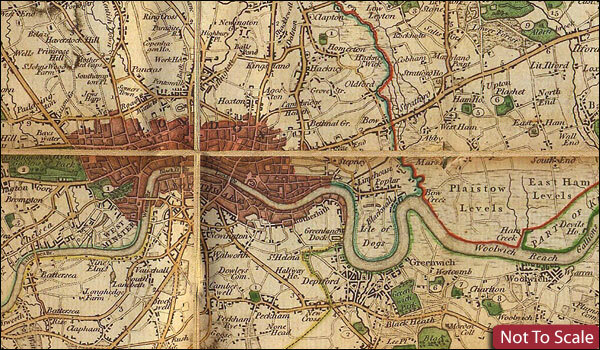 This reproduction was taken from what used to be called a “cloth-dissected” map, made when the map itself was cut into sections and each section then individually pasted onto an overall cloth backing for the whole map. In this version the whole map is backed onto cloth in one piece but the gaps between the sections have been reproduced in the printing to preserve the style and the feeling of the original. 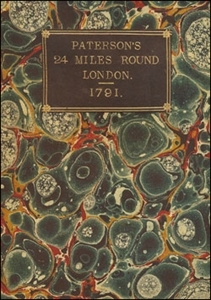 Each individual map is presented folded in a colourful case covered with a unique design marbled paper – no two cases are identical. PLEASE NOTE: this title is also available in a smaller version. To see the list of all the titles in this series from the Old Folding Maps please click on the series link.